A glass tube has a coefficient of volume expansion equal to 28.2·10−6 °C−1, its one end is sealed, its cross-section is the same at each point of the tube and it is 100 cm long at the temperature of 0 °C. Mercury with the coefficient of volume expansion equal to 18·10−5 °C−1 and with temperature of 0 °C is poured into this tube. Mercury reaches so high, that the unfilled space maintains the same volume during temperature changes. How high is the level of mercury? What is happening with the volume of a body when it is being heated and what is the relationship between the volume changes of mercury and the tube, so that the volume of the unfilled space remains constant? When heating the tube with mercury, the volumes of mercury and the tube increase. If we do not want the volume of unfilled space to change, the volume increase of mercury must be equal to the volume increase of the tube. The unknown height to which mercury is poured is obtained by comparing the two increased volumes, which can be expressed by the relation for thermal volume expansion. Furthermore, we use the fact that the ratio of the height reached by mercury and the height of the tube is due to constant cross-section equal to the ratio of their volumes. where β1 is the coefficient of volume expansion of mercury. At the same time, however, the volume of the tube increases with increasing temperature. For this increase it applies. 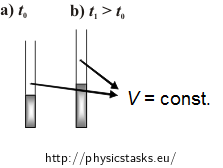 where β2 is the coefficient of volume expansion of glass. Provided that the volume of the unfilled part of the tube is not temperature dependent, the change on volume ΔV1 of mercury must necessarily be the same as the change in volume ΔV2 of the whole tube. Mercury was poured to a height of approximately 16 cm.